Worf version 1.1 has just been released. This update changes the filtering from time domain convolution to frequency domain convolution. The result is drastically improved performance and lower battery drain. The filtering step has been moved to before the plotting step, so you can actually see the effects of your filter in real time prior to recording. 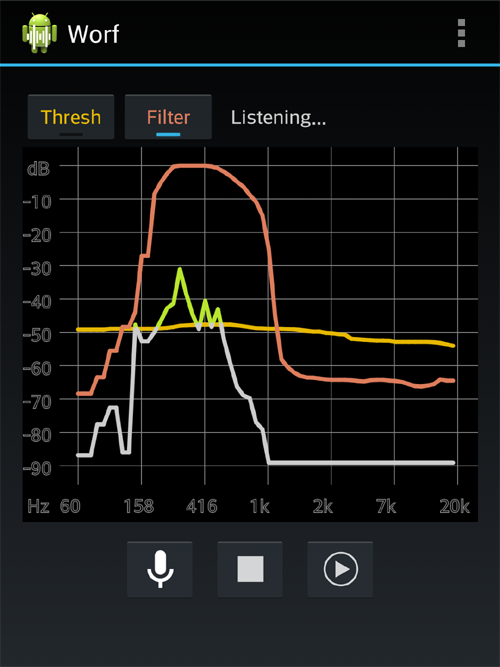 I also learned that the ability to skip silence using the custom thresholds is actually called "SkipSilence" in other audio apps. 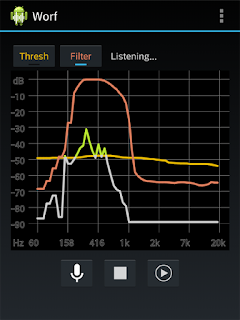 Although Worf is still unique in that you can draw your own threshold over the audio spectrum to specify exactly how you want things to be skipped. Other apps seem to call it a "beta" function and apply their own fixed default level. UPDATE: I decided to throw in a notification message while recording in case people accidentally leave the recording thread running in the background. I also capped the maximum length of a single record file to 2 hours (about 110 MB) so people don't accidentally fill up their storage by leaving it running for days on end. I had to roll the revision to 1.2 for these things. Worf 1.0 is now live on Google Play and available for free. The initial version contains all the advertised functionality and has been tested on multiple devices for stability and performance. I will respond to feedback and any issues people may run in to.